HUGE UPDATE & DC Comics Rebirth Spoilers: Front & Back Of Previews With A BIG CLUE About DC Rebirth! Captain Marvel / Shazam In DC Rebirth Too! Since the publication of the original story, the back cover of the special DC Comics Previews for its June 2016 solicitations, and reveals concerning DC Rebirth between June and October 2016, has leaked. 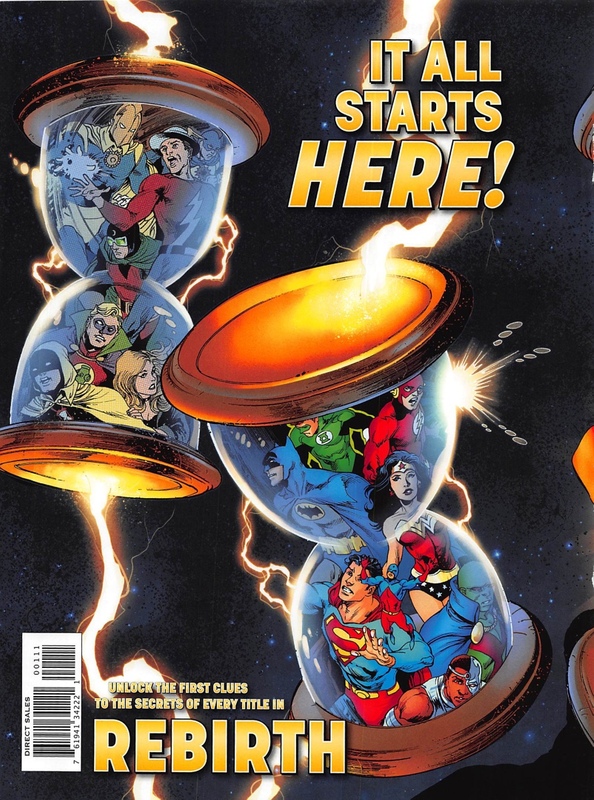 There’s that hour glass again, that we see on the front cover, but this time with the classic Justice Society of America (JSA) trapped in one and the post Crisis of Infinite Earths’ 1980’s Justice League and more in the other. The Legion of Super-Heroes (LOSH) appears to be MIA still. 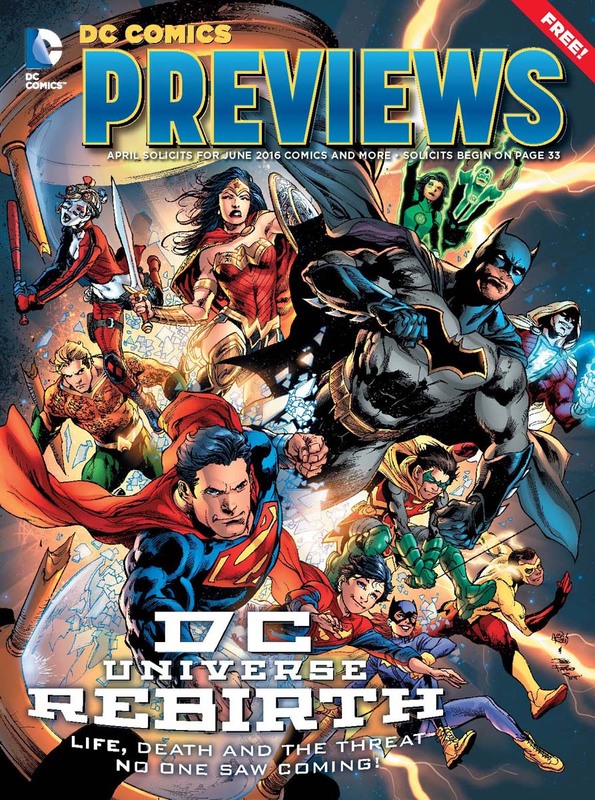 DC Comics revealed the cover to its special free Previews DC Rebirth insert with its June 2016 and beyond goodies that will be released on new comic book day this week. (full DC Rebirth checklist here). It features characters we know headline or are part of DC Comics Rebirth super-teams. However there is one DC Rebirth surprise! Shazam, formerly Captain Marvel, is on the Ivan Reis and Joe Prado cover art for the Previews. This is the first we’ve seen that Shazam / Captain Marvel will part of DC Comics Rebirth. And, anyone notice the big hourglass the characters are breaking or coming out of? Does that mean that a time-associated villain is behind DC Rebirth? That hourglass appears to be a big clue tied into DC Rebirth.